The Hemlock wooly adelgid (Adelges tsugae) is a destructive little creature, causing devastation to evergreen forests from Canada, through the northeastern United States and southward into north Georgia. Accidentally introduced from Asia in the 1950’s, a significant infestation can kill hemlocks (Tsuga spp.) within four years. Some tree species can survive longer although in a weakened state, making them susceptible to other pests and diseases. Controlling this pest on a large scale, as in its natural habitat, is proving difficult but not impossible. A number of options are being explored which are not yet available to the homeowner. Still there are opportunities for those of us who enjoy hemlocks in our own gardens to protect the ones we have. Frequent visual monitoring of the undersides of the needles for small cottony masses is the best way to ensure catching this pest in the early stages of inhabitance. These will be visible on the twigs near the base of the needles. This “wool” is present during all stages of the adelgid’s development but is more noticeable in the spring. Providing the proper growing environment is one the best way to protect hemlock trees. Hemlocks are shallow rooted and is susceptible to stress in low water situations. Provide up to one inch of water per week (including rainfall) slowly to the root zone. Fertilizing with a high nitrogen product is not recommended as it promotes the adelgid’s survival. Periodically applying a strong stream of water to the branches from April to June is capable of dislodging many of the egg and juvenile “crawlers”. These have little opportunity to find their way back to the tree and die. Pruning dead branches allows for better air circulation and promotes new growth. Heavy pruning is not recommended, however. Horticultural oils and insecticidal soaps are my preferred method of control over all synthetic petrochemicals. Horticultural oil kills by suffocation as the fine oil coats the body while insecticidal soaps dry out vital fluids from soft bodied pests. They are relatively safer for the user and the environment and effective at every stage of the adelgid’s development. 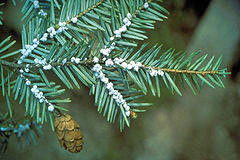 There are a number of synthetic pesticides available to the homeowner for treating the Hemlock wooly adelgid. Others are only allowed to be administered by licensed arborists. Typically they will contain diazinon, fluvalinate, malathion. It is important to note that these pesticides are only necessary once an infestation has been identified as they are indiscriminate (nonselective) poisons, killing beneficials as well. I am not an advocate of their use. Imidacloprid is another insecticide commonly used and considered to be more selective since the chemical is applied to the root zone and drawn up into the plant or tree. Since the adelgid is a sucking insect, it will ingest the poison as it feeds while other potential benefical insects will remain unharmed since they do not penetrate tree tissue. However, this class of pesticide, known as neonicotinoids, has been linked to one of the major contributing factors of Colony Collapse Disorder when used on plants and trees pollinated by bees. Banning its use is an important first step in combating Colony Collapse Disorder. Brand names include Bayer Tree & Shrub Insect Control Concentrate (or 4 in 1 Tree & Shrub Insect Control) or Merit Insecticide. When applying any type of pesticide please be sure to read and follow the label instructions carefully. For a comprehensive look at the Hemlock wooly adelgid and the current options for large scale control I invite you to explore this website. I have a few dozen Hemlocks in our 110 acres of timber. Some are infected. I have some Macho 2.0FL Insecticide and intend spray the root area including auguring some holes in the area to be sure material gets to the roots. PROBLEM: I can not identify the amount of product to apply per tree, per inch of trunk, etc. All I find is the amount to apply per acre and that is hardly helpful. Can you suggest site or reverences to clarify the application? Hi Ron. Unfortunately I have no idea as this is beyond the scope of our focus and expertise. Hope someone else can chime in here with a good answer to your question. Jose, go to any garden center or nursery. I’m sure whatever they carry is fine. But two brand names that are common in the trade are by “Safer” and “Green Light”. “Garden Safe” may also make those.